People in businesses around the world use common terminology for practices, concepts, and procedures that can be found in most organizations. You can find these terms in business dictionaries and at business glossary Web sites, and most serve us well. Some, though, help to defeat us. They carry baggage, and some evoke problematic images. Here are a few examples. The fourth USS Lexington (CV-2), nicknamed the "Gray Lady" or "Lady Lex", leaving San Diego, California, October 14, 1941. 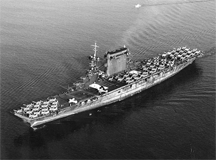 She was the second aircraft carrier of the United States Navy, and was among the first vessels to be part of a "task force." The term "task force" has a first-appearance date of 1941 in the Merriam-Webster Collegiate Dictionary, where it had a purely military meaning. Photo courtesy U.S. Navy, Photo #: 80-G-416362. The purpose of the "cross-functional team" is to blur boundaries, to have a team that functions beyond provincial departmental interests. Why, then, do we use a term that evokes the differences between the team's members, and emphasizes that the members are drawn from the different functional units of the organization? Drawing a distinction between Work and Life adds to the tension between work and the rest of life, and then exaggerates it by using the balance metaphor. Work is part of Life. Whether I'm at work or not, I'm still alive. The problems with this term arise not from an imbalance between parts of Life, but from a failure of the employee, the organization, or both, to acknowledge all the needs of the whole Person. A task force is a temporary team formed to investigate, to create, or to find a new perspective. Usually its work changes the way the organization sees or accomplishes its mission. It's a wonder how we can use the term "Force," and then complain later about the "resistance" we meet when we try to implement the results of the Task Force. Force, by its nature, spawns counterforce. In calling a group a "task force" we take the first step in creating the counterforce. the counterforcewant key people to remain in place through difficult transitions, we need not only their physical presence, but their hearts and their passion. A promise of cash does persuade people to stay, but because it's an extrinsic motivator, it tends to dampen passion. Calling the mechanism "handcuffs" makes explicit our intention of depriving people of their freedom. In business, compensation refers to the array of benefits and payments employees receive. But almost everywhere else in life, to compensate is to provide offsets for harm done. Compensation evokes the idea that to work is to sacrifice, creating an obligation for employers to provide offsets. The reality for most knowledge workers today is very different. Most of us have made great sacrifices all through our lives for the opportunity to hold the jobs we hold. We usually don't view work as a sacrifice that employers must compensate for — until we hear the term "compensation." Would you like to see your comments posted here? rbrenGUcZgkfwlzAGKhXPner@ChacIgTRuRtdqQsyQpYfoCanyon.comSend me your comments by email, or by Web form. I offer email and telephone coaching at both corporate and individual rates. Contact Rick for details at rbrenzEjJXffHAedXDlezner@ChaccNrlGTIolLhmNRRWoCanyon.com or (650) 787-6475, or toll-free in the continental US at (866) 378-5470.